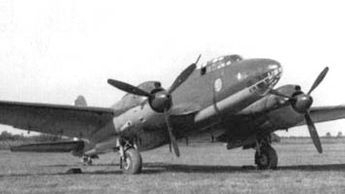 The CRDA CANT Z.1018 Leone (Lion) was an Italian medium bomber of the 1940s. 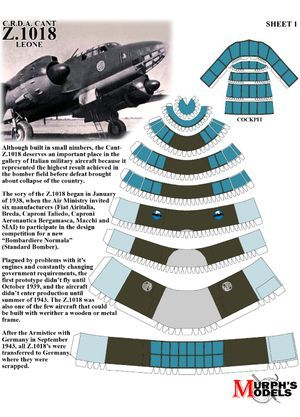 The aircraft, in its definitive form (as the Leone I) was a two-engine medium bomber, with a single tail, retractable undercarriage, and metallic structure. It had duraluminstructure, a skin of light alloy, and a crew of four or five. The contours of the slim fuselage were designed for aerodynamic benefit. As with the Z.1007, the two pilots were in tandem, not side-by-side. Only the first pilot had a complete set of controls, while the copilot had limited visibility and only a few instruments. With over a year of delay, 100 units of the CANT Z.1018 were finally ordered on 31 October 1940. However, on 26 December an additional order was placed for 10 units of pre-series aircraft. Due to problems arising from introduction of the all-metal airframe, the 10 pre-series aircraft were specified to be constructed of wood. It is a rare if not unique case that an aircraft was developed both with wooden and metallic structure, because among the other reasons, the necessity to account for the considerable differences between the weight and the strength of wood and metal structures. But Zappata was a specialist in wooden structures, and his Z.1007 was already in production with wood construction, so this eased the challenge. In addition to this metal-to-wood conversion challenge, the continual government requests for modifications and improvements slowed production. All in all, the CANT Z.1018 Leone was an unlucky aircraft. It was overall an improvement over Z.1007, mainly thanks to the two-engine configuration. This program was hampered, not enhanced, by the continuous requests made by Regia Aereonautica. Engines that were never adequately reliable.